The widely accept planetesimal hypothesis among secular scientists where it is believed that the solar system was built from. According to this hypothesis, planets require material from orbiting dust disks surrounding stars. A new observation by astronomers revealed a dusty circumstellar disk, supposedly 10 million years old all of a sudden evaporated within 3 short years. This was indeed a falsification, none in the circle of consensus concerning the planetesimal hypothesis expected to witness such a rapid change: reduction of infrared emission by a factor of 30 in 3 years, caused by, the astronomers believe, “a correspondingly drastic depletion of the dust disk” in such a short period of time! The reason why some were discounted was because of the catastrophic nature of what went on in which gravity is supposed to produce step by step gains in building planets rather than a complete pulverization that galvanized it out of existence. This observation is not conducive to supposed planet formation according to the planetesimal hypothesis. So how was this explain in the media, phys.org said this was a break through in obtaining new insights on planet evolution. Adding complexity to the hypothesis always creates more problems than it solves which also happens with Darwinian evolution, thus challenging the value on explaining reality. How does a dusk disk disappear so quickly? When you break free of the framework created by consensus it sounds more logical. Stars and planets were created but that is not why they are breaking up so quickly rather it is because of the laws of thermodynamics, that is the cause of the breaking up, not building up. We entrust our scientists with the job of explaining what is going on in the natural world. Keep in mind there is a huge difference between scientific discovery and scientific explanation; it is great to make these observations, but not so great to maintain a false theory in the face of contradictory evidence by invoking ad hoc rescue explanations that refuse to consider non-paradigmatic solutions, such as creation! What Is Your Favorite Scientific Debunked Belief? Here we go, the flat earth concept again, it has been used quite often by certain evolutionists to mock creationists or intelligent design proponents. One wonders how many years has this physicist really studied Christainity or religion? Most likely he has done some study, but ultimately he wrote a response that is based on a lie. Who said Christianity and science were separate? First that say, it’s not a science, then they write in a blog that it’s a debunked science, which is of course is another lie coming from this particular camp of scientists. However, he does have a point about interpretation of the data, it’s based on a person’s logic or way of thinking. But his logic is clearly bias and outright wrong. Science is a tool to learn with. On the other hand, evolution is a story that has been created by man. Take for example, Steven Taylor, a macro-invertebrate biologist from the University of Illinois who spent two decades studying the mysteries of cave life. His adventure was spending a lot of time in tight dark spots in numerous caves, observing bizarre creatures that live in these ecological “islands” cut off from the outside world. Now what he did in this project was about observing, recording data and studying the effects of the above-ground environment on the creatures below ground. It’s good science without a story about evolution. Science that confirms the Bible is another! The cultists in evolution would like the public to believe that understanding these creatures without evolution would be impossible. The cultists in evolution would also like the public to believe that their truth is the way and the light and nobody can interpret nature but them. Answering the question about one’s favorite debunked scientific beliefs shows more than ever a need to open up science research, allow more views, creationist, intelligent design or otherwise! Are Evolutionists Coming To Grips With Primordial Soup? Many of these arguments used in the study were presented by creation scientists many years ago. It has been also presented in here…So, why is it that we have scientific observations which do not confirm life evolving from the soup like the destructive power of ultraviolet light and oxygen coming out now? Because they have finally come up with another way to try and explain how life began, this time through hydrothermal sea vents. These vents have their own problems with creating information for life and then life itself as experiments have already shown. Evolutionary scientists claim the evidence is in the “zinc” instead of what the oceans consist of, “salt.” So how could natural means produce zinc? Can zinc really help produce life because it can store energy? There are so many of these conjecture ideas concerning the origin of life in evolution. What we observe is life comes from life, this is scientific and it’s biblical! The newly discovered fossil also presents a problem about its source location of the missing ancestor. 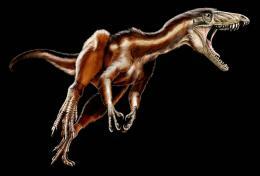 Tawa was found next to two other theropod dinosaurs which were around the same period of time. The article goes on to say that these three dinosaurs were related to those in South America. How could have these dinosaurs migrate so far away? More articles are being published recently that are anti-gradualistic in theme but support abrupt appearance. Creationists have been advocating this for years, the evidence doesn’t show slow and gradual evolution. Proponents of this hypothesis (a non-thinking process) generally want to replace God with it, evolution according to them can do all the things the Lord can do. They focus primarily about gene loss and alterations in the regulation of existing genes – not the increases in genetic information that molecules-to-man evolution would require. Wernher von Braun was behind the creation of rockets in Germany but later came to America to help jump-start the space program which includes putting man on the moon. He faced numerous accusations of Nazi collaboration during his life and still does today. For example, a book recently published called, “The Dark Side of the Moon” makes an allegation. “The consensus arose that he was as much an unwilling victim of the Nazi war machine as those killed by his V2 rockets. His cause was obviously aided when, after the war, he was headhunted by the “right side”, avoiding retribution in Europe by being deployed on the US’s space programme. Von Braun studied mechanical engineering at the University of Berlin. Albert Einstein was in contact with him by answering his questions in a letter. He had a PhD in physics by 1932. Rocket science was a strange concept back then, but Von Braun found the German army appealing because it had a unique small rocket development program under Walter Dornberger. In October 1942, the first successful rocket was launched. This got Hitler’s attention, and Nazi intrusion began to grow. After a very successful attack by the British in 1943, Hitler ordered production of the rocket underground. Himmler, who had visited the Peenemünde center the previous summer, tried to recruit von Braun but when it was rebuffed, the Gestapo arrested him in the middle of the night and was kept in jail for the next two weeks. He was then tried in court by the Nazi regime where he was accused of not having any intend to use rockets for war rather for space travel only. He was also accused of spying and trying to escape. Hitler was convinced by others, the rocket science could not progress without its main scientist. Von Braun was then released. The Nazis gave him two choices, either cooperate or be shot. Yes, people were critical of his decision when faced with life or death and yes it was a mistake to cave in to the Nazis. As far as Mike O’Hare from New Scientist, he presents lame evidence on Von Braun embracing Nazism which is more like guilt by association. The only reason why these liberals attack him is because he went to America where his work in peaceful conditions is still felt today. I say this because Nature one of the major science journals gives Qian Xuesen special treatment. He’s the one who learned to make rockets in the US, later on he went to China to help jump-start their program, let’s look at the difference this guy gets than what Von Braun had to endure. Nature tried to give multiple attempts to exonerate Xuesen from any allegations of cooperation in communist ideology. Qian Xuesen did have an impact on America’s science program as well. However, Xuesen believed he had been wronged by America so he joined the communist party. By going to China where Mao was mass murdering people, about 77 million, Xuesen remained in good standing. He wasn’t arrested or threaten with violence. It’s been five years since the Hubble telescope was able to produce an image from the dark corners of deep space! I really look forward to these types of scientific observations. The further you look out into space, the more complex the big bang theory and other related theories becomes as a result of failed expectations and the more observable data for a younger Universe which confirms the Bible. Most astronomers are surprised that galaxies exist at all let alone they are pretty bright to begin with supposedly 600 million years after the big bang. This is because there is a“lumpiness problem” in cosmology in which structures display abrupt appearance rather than various slow changes. So what about using light distance with all this talk about billions of years, does this cause a problem for creationism? “The temperature of the CMB is essentially the same everywhere5—in all directions (to a precision of 1 part in 100,000).6 However (according to big bang theorists), in the early universe, the temperature of the CMB7 would have been very different at different places in space due to the random nature of the initial conditions. “(1) Early in the alleged big bang, points A and B start out with different temperatures. Time measurement doesn’t cause a problem for the creationist model, the speed of light is not constant, as we’ve been taught since the early 1930s, but has been steadily slowing since the first instance of time. We have observed the speed through various past data and found the speed of light being higher 100 years ago and as high as seven percent in the 1700s! Keep in mind the limitations of historical science. We cannot go back in time or have clocks from A point to B point to determine more accurate measurements. But one thing is for sure, it makes more sense from a Biblical point of view than a world point of view! Can’t wait till the new deep field image! Microscope makers are going where no man has gone before! Within five to ten years this new designed technology is going to make it possible to see more images of phenomena at the molecular level. However, we are not referring to electron microscopes rather we are talking about using light microscopes in real-time! There is more methods being developed which includes compiling images of billions of fluorescent proteins, photo-activated localization microscopy (PALM), and “stochastic optical reconstruction microscopy (STORM), which uses what they call a photoswitchable probe or probes which temporally separates the overlapping images of individual molecules which boosts resolution to ten times better than the diffraction limit and so on. It’s very nice to see no storytelling about Darwinian evolution and not only that but the new technology is a vital tool when observing the craftsmanship of God’s design in nature. It’s going to bring out details beyond our wildest dreams which is very beneficial for creationism but it’s also going to cause problems for evolution, expansion and more complexity in their storytelling will grow like leaps and bounds because of the detail of specialized complexity. For some evolutionists, they feel when they have answered one question and five more questions pop up as a result is job security because the mystery leads to more mystery it never ends. As creationists and Christians, nature will be showing some awesome designs to learn from that were created by God, it’s the future for observations and more evidence in the microscopic world.